I’ve been interested in the business uses of immersive technologies for over a decade. I’m NOT embarrassed to admit that I ran a global publication, ‘SLentrepreneur’, dedicated to the virtual world of Second Life. The digital magazine focused on the real-world, business uses of Second Life and explored how companies like IBM, KLM and dozens of universities and training facilities were using the platform to help cut costs, improve services and create experiences that were once thought impossible. In many ways, Second Life, was ahead of its time and eventually many businesses decided the new technology was too unwieldy and risky for future investment. A decade has passed and I’m excited to see the business case uses of cutting-edge technologies such as virtual reality and augmented reality surging into the mainstream. While the benefits to the enterprise, such as cost efficiencies, may now be obvious, my real excitement lies within commercial applications that have not yet even been imagined. When I first experienced virtual collaboration with my remote team from around the globe and witnessed ‘in-world’ broadcasts over ten years ago, I KNEW that someday the business implications would be profound. That day has arrived. Why Commercial VR? Why Now? One of the biggest obstacles to mainstream adoption of VR has been around the costs of the hardware and a shortage of high-quality content. The average consumer had no compelling reason to invest thousands of dollars it required to experience the technology at home. VR and AR for businesses however, DID have a very compelling reason to invest the funds required to develop applications that could do everything from cut costs to help save patient’s lives. 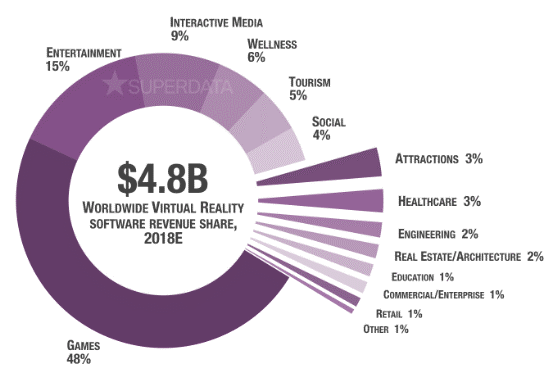 According to recent research by SuperData, the VR software market is poised to grow from just under $5B to over $25B by 2020 with the bulk of that growth occurring in non-gaming applications such as interactive media, wellness, tourism and social networking. 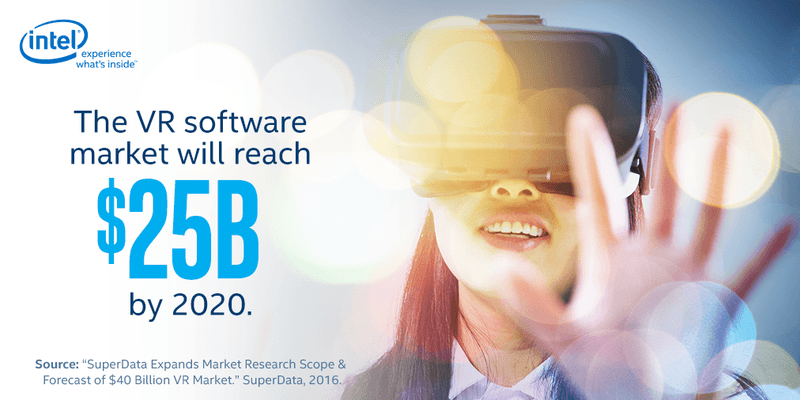 This growth will fuel a surge in high-quality, VR content that will help expedite mainstream adoption. Another major obstacle limiting the growth of both business and consumer VR markets is the means of delivery. There are currently several head mounted displays on the market of varying quality, including the least expensive option – mobile VR. The fragmented landscape of distributing VR content and the relatively low numbers of consumers who have access to devices has been an insurmountable obstacle for many content creators. 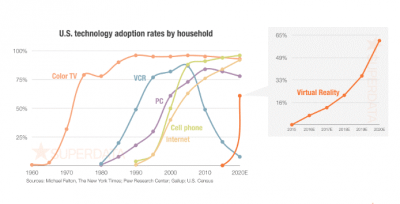 However, the data predicts that VR is about to reach mass adoption in the same way color TV’s and computers were adopted years before. 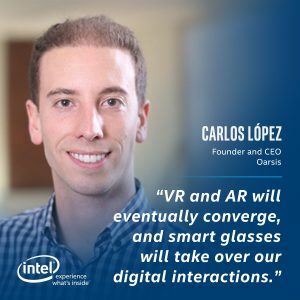 These factors coupled with continued VR and AR technology investments from companies like Google, Facebook and Intel means that we are very likely on the brink of a HUGE shift in the way technology impacts our daily lives. You can learn more about Intel’s investment in VR technologies in my recent article, ‘VR’s Breakthrough Moment: What will it take?’. Many industry experts are banking on commercial VR eclipsing gaming VR in the years to come. Events such as the upcoming VR World event in London are bringing these experts together to explore future commercial case uses of VR and AR. I’m excited to be attending this year’s VR World conference and look forward to learning more about this exciting frontier. Feel free to follow @IntelITCenterand @LisaPeyton on Twitter to get real-time conference updates. Several of the event speakers along with other commercial VR luminaries were willing to answer a few key questions and make some exciting predictions about the future. You can read quotes from the experts below. If you are planning on attending VR World, please reach out and send me a tweet. I’d love to connect. 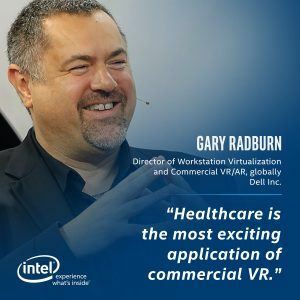 Gary Radburn, Director of Workstation, Virtualization, Commercial VR and AR globally, Dell Inc.
"My personal view is that healthcare is the most exciting application of commercial VR. Furthering the treatment of people who have been in traumatic situations, whether mentally or physically, and using VR to rehabilitate or trick the brain into activating dormant neurons is beyond sci-fi. It amazes me how some really smart people have thought outside the box and extended VR into areas never considered when the products were first conceived." "Commercial VR applications will eventually outpace gaming, gaming/entertainment will always be a popular industry that grows relative to the overall VR/AR market. At the moment, the one thing limiting commercial application/usage is resolution – writing is difficult to read and you cannot just work on the applications on the desktop inside VR. The adoption of VR will start to increase in commercial when resolutions increase and application vendors really start to take advantage of VR capabilities. This will then progress into AR, where the commercial markets will find even more uses as it does not isolate from the outside world and prevent other interactions. It is at this point the market will shift more to the commercial side when gamification of training and operation becomes a real alternative." "Applications that are running are the key to buying the most appropriate system. A gaming machine that run professional applications may be seen as the most cost effective way of approaching VR but this is not the case. Lower frame buffers, systems that are not designed for 24/7 operation, consumer level cards and drivers that constantly update and phone home do not give a good professional experience. A workstation machine that can run VR is a far better option for all the reasons above. Independent Software Vendor certifications are still in place to ensure support of mission critical projects, components are designed to run 24/7 and be available throughout the life of the product. This reduces errors and allows creation of VR data at the highest fidelity possible with the final output being rendered down to the limitations of the destination, consumption platform. Customers should consider that today the workflow is still the same for VR as it ever was. VR is just a new destination or viewing device – the workflow is still 80% the same, it is only how you check and reiterate that has changed until such time as we get full on ‘Minority Report’ interfaces." "VR is going to be most exciting around how people interact and communicate with each other. You can see from Facebook’s announcements at F8, such as Facebook Spaces, that they’re really keen on allowing people to use the technology to connect and enhance social experiences. This allows the applications of the technology to go far beyond gaming and tech. I think it will have implications for the workplace and social situations. Within ten years VR and AR will be much more commonplace and people will be far more comfortable using the technology – it will be more seamless. Hopefully that should mean that we rely on and interact with screens far less and have a more natural interface with technologies that we’re using, through sound, touch and voice." "Just thinking about VR in terms of gaming is pretty narrow in terms of its potential. I’m sure that gaming will drive uptake as consoles and games are released, but particularly if you look at mixed reality, there are far broader applications. For example, there are some great examples of how VR is being used in surgery, helping to train people to carry out highly complex tasks where you can’t afford to make a mistake. Facebook is thinking about how to make VR more social, while HoloLens and Magic Leap could well be used in the workplace and to enhance stores, allowing people to try out products seamlessly." 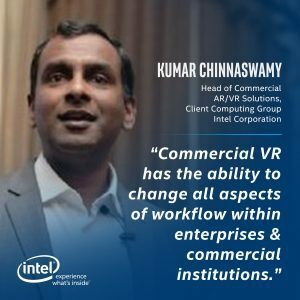 "Commercial VR has the ability to change all aspects of workflow within enterprises & commercial institutions. From product design, to customer engagement, to training, to marketing & more! I do think VR/MR based training is a truly compelling experience which can span across commercial verticals. 7. Commercial VR/MR/AR will permeate all aspect of our life over the next 10 years: from the way you learn (Education), to the way you buy (Retail), to the way you build your next house (Visualization), to how you interact with your colleagues/friends (Social VR/MR)." "There are a couple of trends holding back Commercial VR compared to the consumer space: 1. VR content investments in the consumer market significantly outpaces that in the commercial space 2. Commercial adoption of new technology has a painfully long sales cycle (6-12 months). Moreover, the content ecosystem for the consumer space is consolidated around the mature gaming industry. But on the commercial VR side, the ecosystem will need to mature to support customized solutions for verticals ranging from Education to Automotive markets. In the next 5 years, expect these to gaps (compared to the consumer space) to be closed." "Commercial VR can deliver significant value back to the enterprise. VR visualization can help shorten TTM & reduce risk for products, VR can be a very powerful tool for training & safety, VR enables new customer engagement modes and potentially new business models. The challenge today is how can ISV/Solution providers create solutions which can be easily adopted by existing workflows within these end commercial customers. At Intel, we are always looking at way in which VR can adopted – our CES press event was done completely in VR! 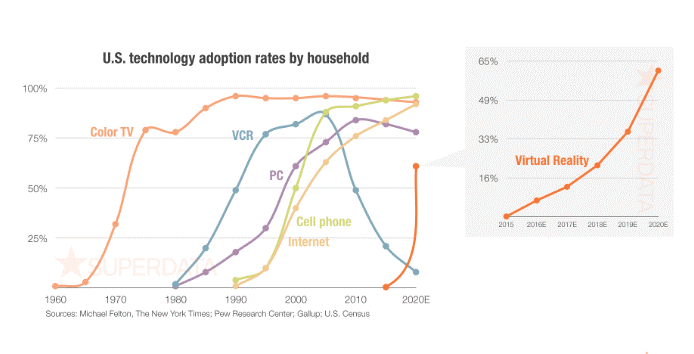 Today’s VR tech is still 1st gen – its adoption held back by need to set up complex hardware (e.g. lighthouse towers for outside-in tracking) and the need a tether to a PC. 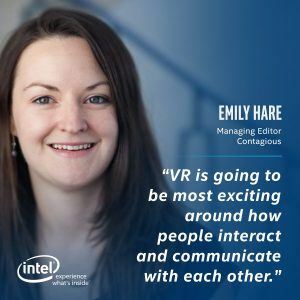 Within Intel, we acknowledge these barriers and are actively working to make the next gen of VR significantly easier to adopt within an enterprise." "I get most excited by experiences that blend film, immersive theatre and gaming seamlessly. The BBC’s Home – VR Spacewalk is a particular favourite of mine at the moment. I don’t believe true VR will be as mainstream as AR. AR will touch every element of our lives to a greater or lesser degree – retail, medicine, industry, transport – they will all benefit from an augmented layer of interaction." 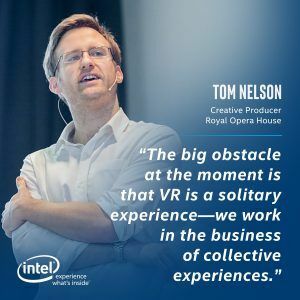 "In my business, VR has the potential to reach whole new audiences with opera and ballet performance. So it’s a medium that can be productized for experiences. Coupled with that, we see exciting potential for VR/AR to influence the process of making opera and ballet. Streamlining the production process for example. The big obstacle at the moment is that VR is a solitary experience - we work in the business of collective experiences." "I believe that VR Education will be the real "killer app" that will drive further user adoption in both consumer education (schools & universities) and professional education (specific niche markets such as industry, field services, etc.). The added-value of VR training is evident, allowing a faster learning process, fewer human errors and therefore increased productivity. We will start seeing more and more MR (mixed reality) applications in the next 10 years. VR and AR will eventually converge, and smart glasses will complement and take over our digital interactions (on top or instead of our phones). Humans will then feel more connected to the digital world and the internet, allowing for better and more relevant information (in connection to IoT services), and better communication between each other (through holographic and volumetric streaming)." "Always accurately define the problem and specification requirements for the project, before proposing hardware solutions. One size does not fit all." Diving into digital marketing during its nascent stage, Lisa Peyton is today among the leaders in the field, particularly so in the Pacific Northwest. 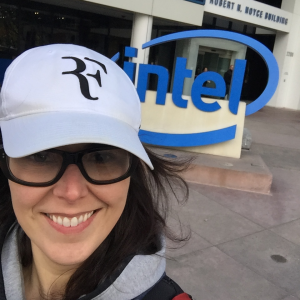 Based in Portland, Ore., she serves as Intel’s Global Social Media Strategist. Her hands-on experience includes implementing successful digital strategies for both B2B and B2C campaigns, for brands such as Alaska Airlines, Hewlett Packard Enterprise, Power Rangers and Paul Frank. The quality and breadth of her work has been recognized with several SoMe social media awards. As a pioneer in the social media industry, Lisa has been both guided by the industry’s evolution and had a hand in directing it, capitalizing on the power of social media to increase her clients’ online visibility and overall marketing efforts. She has honed her skills to specialize in comprehensive digital strategies, to include social media strategy and development, brand storytelling, audience engagement and education. Combining a measure of lightheartedness with her social media mastery, Lisa has tweeted as Mad Men character Bobbie Barrett. Her tweeting as the acclaimed AMC show’s notorious vixen garnered national attention and a SAMMY Award nomination.